Thursday, October 22 at Echoes Under Sunset - "Fake It Till You Make It"
Hey, Los Angeles! It's story time! 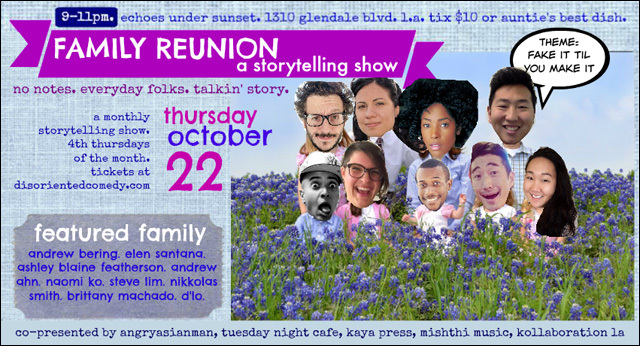 You are invited to the latest edition of Disoriented Comedy's monthly live storytelling show Family Reunion, co-presented by Angry Asian Man, Tuesday Night Project, Mishthi Music and KAYA Press, features regular everyday folks talking story. No notes. The theme of this month's show is "Fake It Till You Make It" and will guest-curated by actor, writer and The Moth's Los Angeles StorySLAM winner Naomi Ko. The evening's lineup of storytellers includes Andrew Ahn, Andrew Bering, Ashley Blaine, Steve Lim, Brittany Machado, Elen Santana, Nikkolas Smith, and host D'Lo. Host: D'Lo (Amazing Actor, Writer, Comedian, Performance Artist, Producer. Seen in "Sense 8," "Transparent," and so much more! Make some plans, bring a friend, hang out and hear some stories. It's always a good time. For further details about Family Reunion, check out the Facebook event. To purchase advance tickets, go here.